David Poile, GM and Predators president of Hockey Operations welcomes new President and COO Sean Henry and new CEO Jeff Cogen. Also pictured is Tom Cigarran, Predators chairman. 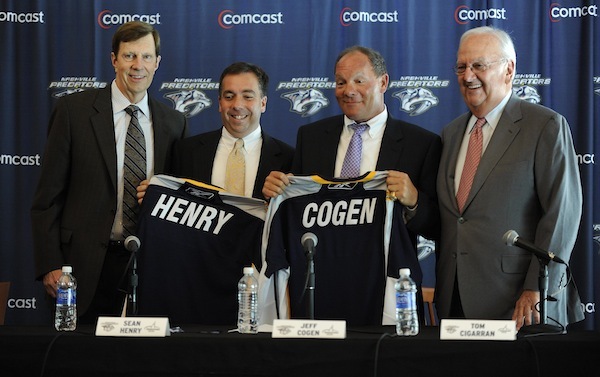 It is a package deal – Jeff Cogen and Sean Henry, announced as the new CEO and president/COO of the Nashville Predators of the National Hockey League and the Bridgestone Arena on Aug. 10. Though it wasn’t technically a package deal, they did literally walk in the door together. “As Sean said, he’s glad they decided to hire two and, as I said, I was glad it wasn’t two for the price of one,” Cogen said. He took the circus to Detroit and Mike Illitch and Jim Lites hired him to be the marketing guy for the Detroit Red Wings and Joe Louis Arena, from 1986 to 1993. From 1993 to 2001, he worked with Lites to start the Dallas Stars National Hockey League franchise. In the middle of that experience, owner Tom Hicks moved him to the Texas Rangers. From 2001-2003 he was COO of the Florida Panthers, where he worked with Henry. He came back to Dallas to the Stars in 2004 and was named president in 2007. Asked how much impact the pending sale of the Stars had on his decision to move to Nashville, Cogen said that it was minimal. The decision was based on the fact that CEO is a promotion from president; Nashville is a town he loves and one he wants his family to grow in; it’s nine hours from his hometown of Newport News, Va.; and he believes he can have an impact on sports and entertainment in Tennessee. Cogen is also innovative in bundle programs, helping introduce food and beverage on regular season tickets for the Stars last year and looking at the possibility of paperless tickets this season, which is a convenience for the fan and a way to mine the data on individual buying habits, Mayne said. Henry has been consulting CEO with the Tampa Bay Lightning of late, and had been COO of the team and arena since 1999. His expertise helped turn the St. Pete Times Forum into one of the busiest buildings in Florida. Ed Lang, current president of the Nashville Predators, will be leaving the organization after a transition period. The arena is run by Powers Management, a wholly owned subsidiary of the Nashville Predators, and there has not been a venue manager per se since Hugh Lombardi moved to Boston to be general manager of TD Garden in January.